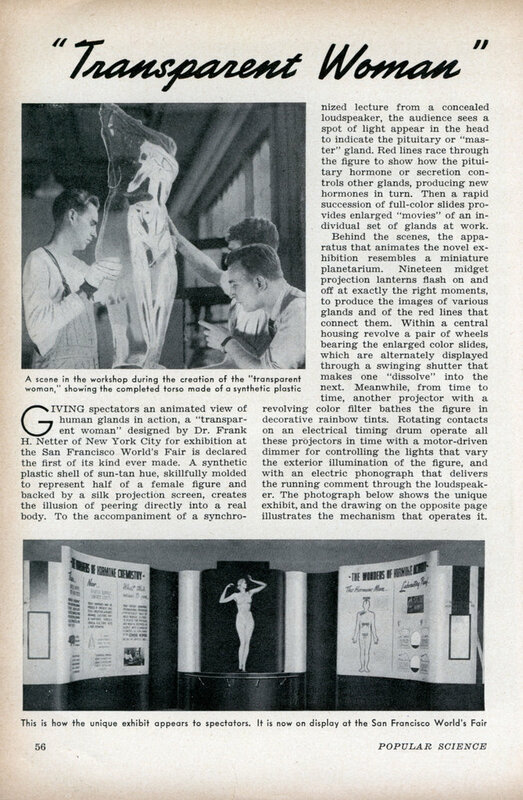 GIVING spectators an animated view of human glands in action, a “transparent woman” designed by Dr. Frank H. Netter of New York City for exhibition at the San Francisco World’s Fair is declared the first of its kind ever made. A synthetic plastic shell of sun-tan hue, skillfully molded to represent half of a female figure and backed by a silk projection screen, creates the illusion of peering directly into a real body. To the accompaniment of a synchro- nized lecture from a concealed loudspeaker, the audience sees a spot of light appear in the head to indicate the pituitary or “master” gland. Red lines race through the figure to show how the pituitary hormone or secretion controls other glands, producing new hormones in turn. Then a rapid succession of full-color slides provides enlarged “movies” of an individual set of glands at work. Behind the scenes, the apparatus that animates the novel exhibition resembles a miniature planetarium. Nineteen midget projection lanterns flash on and off at exactly the right moments, to produce the images of various glands and of the red lines that connect them. Within a central housing revolve a pair of wheels bearing the enlarged color slides, which are alternately displayed through a swinging shutter that makes one “dissolve” into the next. Meanwhile, from time to time, another projector with a revolving color filter bathes the figure in decorative rainbow tints. Rotating contacts on an electrical timing drum operate all these projectors in time with a motor-driven dimmer for controlling the lights that vary the exterior illumination of the figure, and with an electric phonograph that delivers the running comment through the loudspeaker. 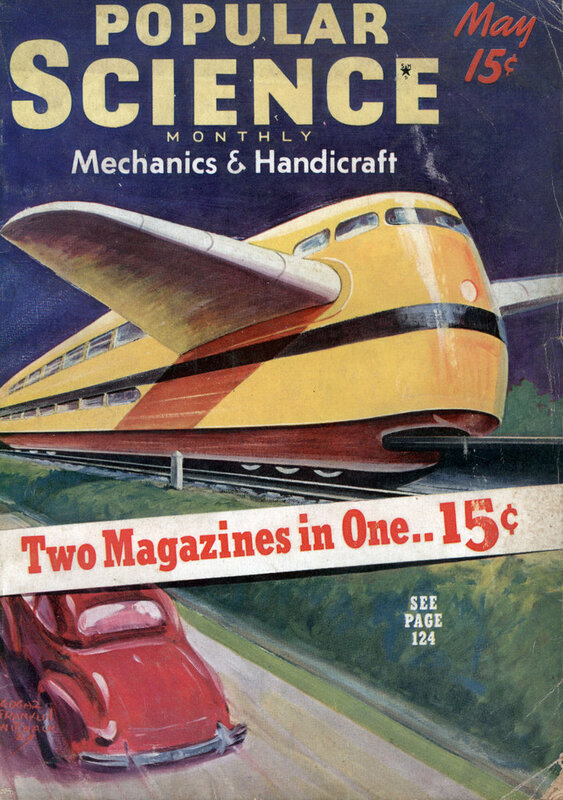 The photograph below shows the unique exhibit, and the drawing on the opposite page illustrates the mechanism that operates it.